Grape leaves are by far the best mehsheh ever, in all forms and colors! Every mountain house must have a vine growing on a steel structure, over the roof (which protects from the summer sun too, and is bare in the winter, so the sun heats the roof and the house) or in its garden (perfect to sit under), for ennab el meeydeh, table grapes—black or green, often of large size, of varieties like maghdousheh (small green grapes), vaitamouneh (big green grapes), or eenab kroum (low-hanging vine grapes,), and obeidi and merwayih, small grapes with a high sugar content, used for arak production. Arak is a traditional distilled alcoholic beverage in Lebanon, made from grapes and flavored with aniseed, and is somewhat similar to ouzo. Meeydeh or kroum, early spring’s tender grapevine leaves, are a delicacy, and are eaten raw with a tabouleh, or stuffed and cooked, as here. Only tender leaves are picked, as they toughen very quickly and become inedible, which makes the season very short, and so there is a need to pick the maximum amount of tender leaves and preserve them for the whole year by pickling them, or packing them tightly in a sealed jar, or nowadays more often by freezing them. Dice 3 of the tomatoes and the onion and rub the onion with a pinch of salt and pepper. Rinse and drain the rice. In a bowl, mix the rice, diced tomatoes and onion, parsley, mint, scallions, chile powder to taste, the lemon juice, and the olive oil. Season to taste with salt. Drain excess juice from the stuffing, reserving the juice. Start by stuffing the leaves as described above. Cut the remaining 2 tomatoes into thick slices and arrange in one layer in the bottom of a large pot, to give extra moisture and flavor and to prevent the leaves on the bottom from burning or sticking to the pot. 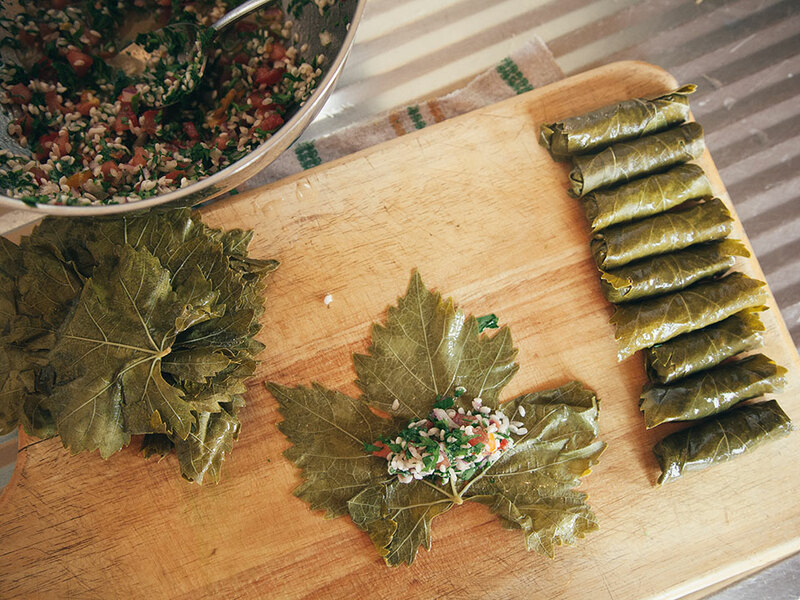 Arrange the stuffed grape leaves on top of the tomato slices, in a circular pattern and close enough together so that when cooked they will form a “cake” that can be turned upside down out of the pot. When the pot is full and well packed, add all the reserved stuffing juices to it—the liquid should just cover the leaves, so add some water if necessary. Taste the cooking liquid; it must be strongly flavored with salt, lemon, and red chile, as those will dilute during cooking and enhance the taste of the stuffed vine leaves. Cook over low heat till the leaves are tender and the stuffing is cooked through. Let cool in the pot to allow the leaves to stick well together. Then you will be able to turn the pot upside down, transfer the “cake” to a large plate, and serve it this way. Note: In the meat version of warra’ arrish, grape leaves are stuffed full, rolled into small bundles, and arranged in layers in a pot, with lamb cutlets in the bottom of the pot and loads of garlic cloves all around. A good warra’ arrish will cook for several hours on a small fire until its sauce is thick and dark green and the cutlets are meltingly soft.